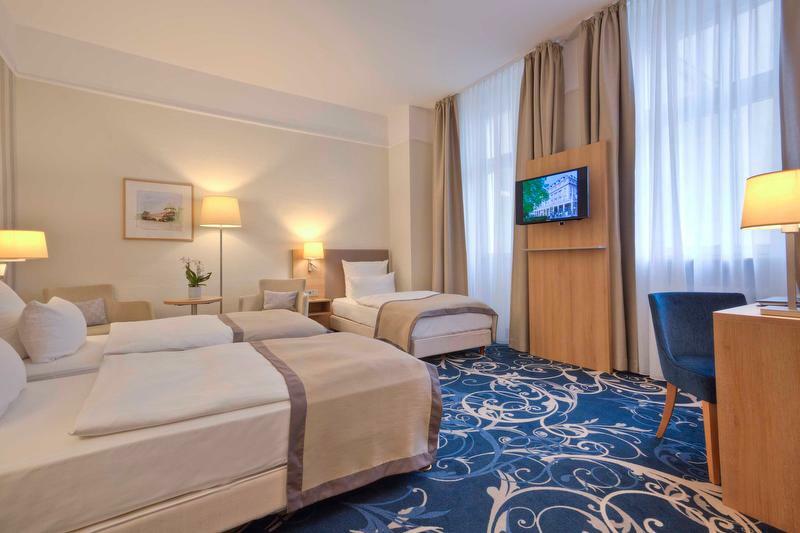 Our single rooms “Classic” are 12-20 sqm in size and decorated in a classic style. All rooms are equipped with twin or queen-size beds, private bathroom (some with daylight), shower, toilet, desk, seating, digital TV with 2 free Sky channels, air-condition, telephone, Wifi, minibar and hairdryer. Our triple rooms are 22-34 sqm in size and decorated in a classic style. The triple rooms are spacious rooms with a view of the inner courtyard. All the rooms are equipped with single size beds, private bathroom (with daylight), shower, toilet, desk, seating, digital TV with 2 free Sky channels, air-condition, telephone, Wifi, minibar and hairdryer. Schlosshotel Karlsruhe – Historic Hotel in Central Location. Our 4-star hotel welcomes you with a stylish ambience and historic charm, which makes it the perfect location for your holiday, meeting or event. 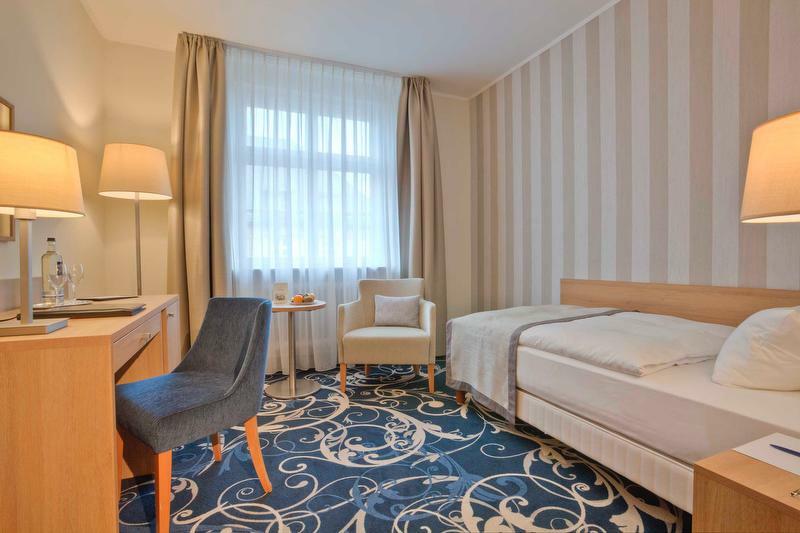 Our hotel is located near the train station in Karlsruhe and guarantees a calm and comfortable stay with excellent service. Our hotel welcomes you with 93 comfortable rooms and 3 spacious junior suites. A rich and extensive breakfast as well as the use of Wi-Fi are included in the room rate. Find out more about our rooms & suites here. During your stay you can use our sauna and fitness area for a small additional charge or relax during a massage. The page relax, fitness & massage provides you with all information about our offers. Enjoy the excellent cuisine of Baden in our restaurant Schwarzwaldstube or go out for lunch or dinner in the city of culture, Karlsruhe. In the evening, we are pleased to welcome you in our Schlossbar. This cocktail bar with a cosy lounge-terrace is one of the city´s most popular meeting points. Our exclusive brunch buffet offers a variety of seasonal delicacies every second and fourth Sunday of the month as well as on selected holidays. Experience the beautiful city of Baden, Karlsruhe, during your meeting or conference. With its five seminar and conference rooms, the Schlosshotel Karlsruhe offers the ideal location for your event. You can find more information on our page conferences or by contacting us. Whether you would like to celebrate your wedding, a New Year´s Eve dinner or a private event, the exclusive atmosphere of our property and our personal and professional service offers the perfect conditions for your private event. Please contact us or get more information about our rooms and offers on our page celebrations. Check-In: from 03.00 p.m. | Check-Out: by 11 a.m. on the day of departurereception. Additionally we offer a late check-out until 04.00 p.m. for an extra charge of 25,00 EUR (subject to availability).